Having traveled Japan for the past 35 days, we're well on our way to our new home for the following two weeks in Vietnam. Where did we stay the night in Ho Chi Minh? We stayed at the Jungle House hostel for the second night, for just $4! Contrary to being told that we had to move hostels, we got moved within the same hostel; upgraded may be a better way to put it. Now, we're in a room of four versus eight. Upon night time, we took notice to the faulty air conditioning. Dripping sweat while you're trying to get to sleep is uncomfortable and makes it difficult to slumber. Manually tinkering with the A/C was useless, as it came on randomly by itself at one point, and ended up staying on for the rest of the evening. *UPDATE: Only has been an issue once. A/C has been working smoothly since. Beyond that, fellow hostel guests were causing a ruckus in the evening. You'd be surprised at the amount of noise these people produced! It was as if they were having a shouting competition. Also, our roommate came in near midnight and flicked the light switch on and begin playing games on his phone, disturbing any worthy sleep we were planning on getting. The staff here, though, seem to work with what little resources they have and tried to make it a relatively comfortable stay for us. They have allowed us to leave our bags here and even extend our check-out day twice now with no problem. We are reminded of the luxuries we are accustomed to in the US and how the rest of the world lives. Although we are faced with challenges on a daily basis, it makes life that much more interesting. After all, problems cannot be completely eliminated; they can merely be exchanged for different problems. Currency conversions, immigration policies, language barriers, and lodging arrangements are all technically problems, yet ones we embrace, having chosen to travel abroad in the first place. We started off the day by going on a quest to find some coffee. Immediately stepping out of the hostel, we almost got hit by a motorbike as it zoomed through the alley! Walking toward the marketplace, we were greeted with everyone already hard at work early in the morning. Merchants were slinging mud crabs and dragonfruit like it was nobody's business as the stench of durian fruit and fish permeated the area. Finding ourselves at what seemed to be a reputable business, we opted for cà phê đá, or Vietnamese iced coffee. One sip and we were hit with a pungent and flavorful beverage that got us going for the day. The coffee here is made differently than the US. First, the beans are robusta, versus arabica which is most popular throughout the world. Second, they use a drip method with slightly over-roasted beans. Both of these factors contribute to a thicker brew and a stronger cup of Joe. We then went back to the hostel for a bit and had some breakfast. Soon after, we hit to the streets with one mission: find some sandals. The shopping arcades in Japan had everything imaginable for sale... except sandals. Well, at least the kind we were looking for. Having been in Ho Chi Minh City for a measly five minutes, we were already sweating bullets, clothes and socks getting drenched in turn. Garrett opted to walk in flip-flops and immediately regretted it, as the plastic dug in between his toes. Surprisingly, Ben's Vans sneakers were still holding up, having been from the beaches of San Diego to the snowy mountains of Mt. Fuji. Either way, both of us were on the lookout for some durable sandals, so upon our hostel staff's recommendation we set off toward the market to barter for some. Sticking out like sore thumbs, we were prime targets for the merchants as we meandered through the cramped market. A couple steps in, we were handed a menu and sat down at a table by a friendly fellow who then took our orders. Another guy came up to us with a different menu - this time for fruit smoothies - and then a kid came with an assortment of mint leaves and various pho toppings. Out came our meals and smoothies after, in that order. We were blown away not only by the speed, but flavor as well. It seems they had a pretty thrifty family business going on. It's worth mentioning that Vietnamese cuisine is deceptively simple, yet undeniably good. Fresh, local ingredients are the staple, with a selection of herbs and spices usually provided for the consumer to customize. Noodle based dishes like pho and French inspired dishes like banh mi and pastries seems to be all the rage here. We're definitely not complaining! After paying our tab, we nudged through the weasel poop coffee and Gucci sandal replicas until we came across a sandal shop. Three Vietnamese ladies interrogated us and had us sit down on a stool and take off our shoes, fitting us for sandals before our sneakers were even removed. Garrett tried out a couple pairs and found one that tickled his fancy, so he handed over some dong and walked out with a fresh pair of footwear. Ben, on the other hand, wasn't too impressed by the selection. Bumping through the crowds, an eager saleswoman inquired what we were searching for. Upon learning that we were on the hunt for some sandals, she hollered at what was presumably her colleague, who ushered us into her booth. Ben informed her that he was looking for all black sandals in particular, and was encouraged to take a seat as she walked away into the crowd. She came back with one black sandal, size 8, and had Ben shoot his best bid. A bit of back-and-forth negotiation occurred, and Ben walked out with a pair of sandals for 300k VND, down from the asking price of 800k. Not a bad bargain! Walking down the street dodging cars and bikes, we stumbled across a restaurant that looked worthwhile. Stepping inside, we were seated and had ordered within a couple minutes. Garrett got pork belly with rice, and Ben had snakehead fish with rice. We had to let the food cool off for a bit before we dug in; the steamy broth would've scalded our tongues otherwise. The flavor was great but the portions were tiny, consisting of mostly pork fat and fish bones. Luckily this was not much of a concern for us as each meal costed us roughly $1. After fulfilling our hunger for the time being, we got to stepping. The realities of war were before us as huge tanks, artillery, bomber jets, and boats with machine guns were displayed throughout the courtyard at the museum. We saw the impenetrable war machines emblazoned with camouflage and could barely begin to comprehend the damage these vessels were capable of, until we went inside. 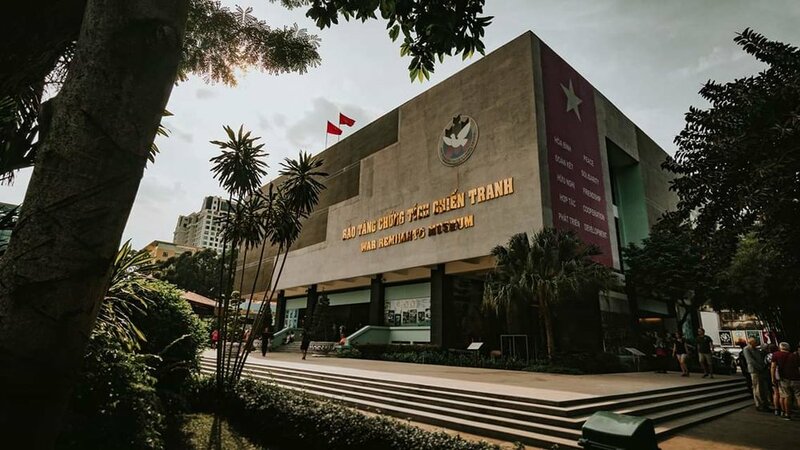 This four-floor museum was packed with photos, memorabilia, and relics of the past displaying the atrocities of the Vietnam War. It was arranged in such a fashion that visitors could start at the beginning of the Vietnam War and go back in time 20 years until the conclusion of the war in 1975. Words cannot even begin to explain the horror of this event. Although war can tried to be justified, the countless innocent bodies slain and destruction of civilizations far outweigh whatever seemingly appropriate description may fit. We highly recommend you take an hour out of your day to visit the War Remnants Museum in Ho Chi Minh. It's incredible that just over 40 years later, Americans like us are visiting places like Japan and Southeast Asia, and gradually restoring friendship and trust among our neighbors. It's quite an opportunity to be traveling Vietnam like this, and the museum really put things into perspective for us. We've visited several Buddhist temples throughout Japan, and they were unique in their own way. The Ngoc Hoang Pagoda, also known as the Jade Emperor Pagoda, was the first Taoist temple we had seen. The courtyard in front of the temple had a pond with tortoises swimming about, a symbol of good luck and longevity in Asian culture. Incense smoke clouded the dimly lit entrance while hundreds of statues filled the temple and worshiping areas, representing a meeting of genies with the Taoist god himself, the Jade Emperor. 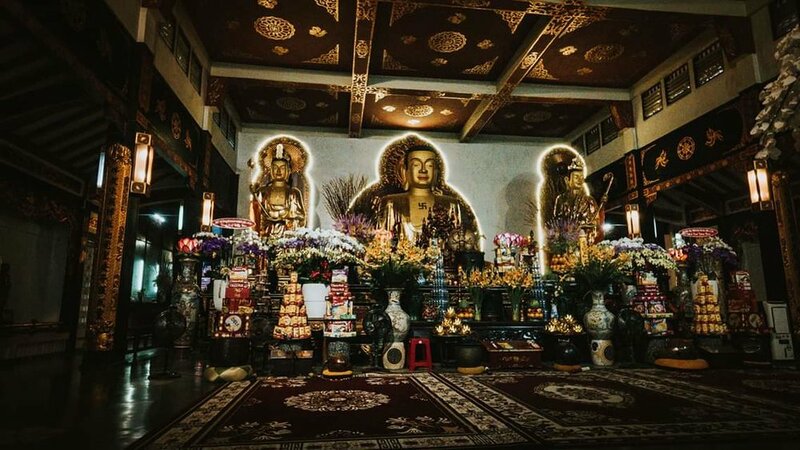 The inside of the temple was brilliantly designed and clearly reflected influence from both Buddhist and Taoist philosophies. Walking its grounds we felt a day in the life of the locals. While not everyone practices, it surely represents the immediate majority of individuals in the area. The streets are filled with idols seen herein, taking themes back into their homes. Leaving we carried our own treasures: incense and a depth of culture. After walking several miles we approached the pagoda, but not without first bracing ourselves from the flock of incense-toting peddlers right outside the entrance. Once we squeezed by, we were immediately impressed by the atmosphere. In the center of the courtyard stood a tall Guanyin statue with a Vietnamese flag gently blowing in the wind. A local explained to us that visitors would often frequent the pagoda in the evening to pay their respects to the Buddha. He also informed us that the first floor was open for exploration, but the second one was reserved for sanctuaries. With that, we entered the pagoda and were reminded of our Japan trip by the style of the Buddha statues placed about. 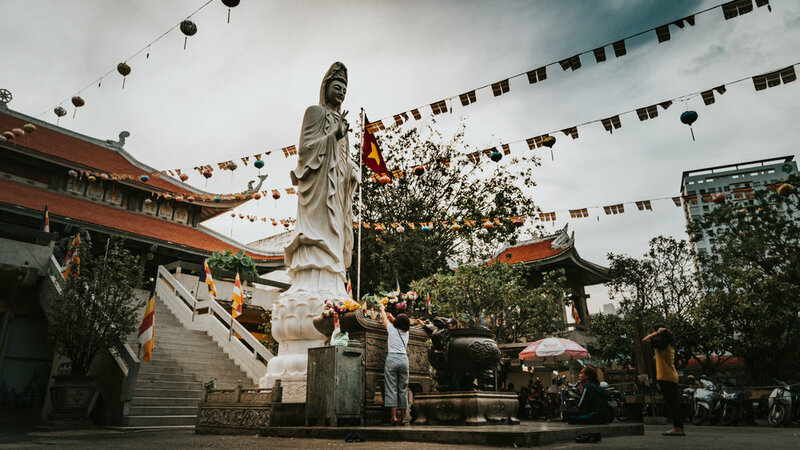 We learned that the building was constructed with the help of the Japan-Vietnam Friendship Association between 1964-1971 and although it represented traditional Vietnamese architecture, it was the first pagoda of its kind to have been built with concrete. Not too far from the pagoda itself stood a seven-story tower known as the Kwan-Yin tower. It was easily seen from afar and towered over everything in sight. We learned that it was the tallest stone tower in Vietnam! Venturing out behind the temple, we came across this Ksitigarbha, or god of earth, statue situated among some apartment buildings. Apparently, this is a community tower and it houses the relics of deceased followers. How much did we spend traveling in Ho Chi Minh today?